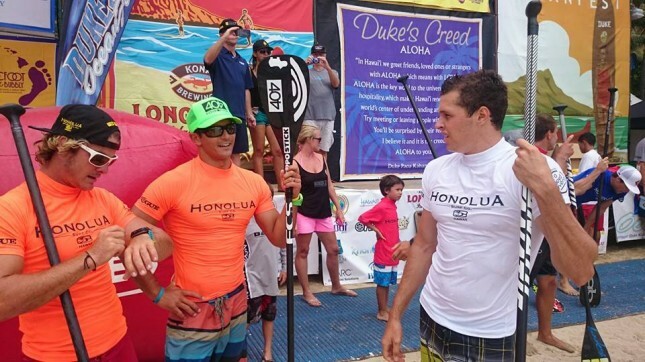 Connor Baxter and Annabel Anderson have just won Honolua Surf Co.’s Ultimate SUP Showdown here in Waikiki, Hawaii. The Starboard duo proved yet again they’re the best, defeating an all-star lineup to claim one of the biggest races of the year. After two full days of world-class surfing and racing action, it all came down to the 15-minute ‘Showdown’ grand finale, a slalom race in the surf that featured a who’s who of the paddling world. Living up to their superstar status, Connor edged ahead of Kai Lenny to claim the Showdown finale race, with Danny Ching, who had to fight through the pack after being relegated to the second starting row, coming home third. 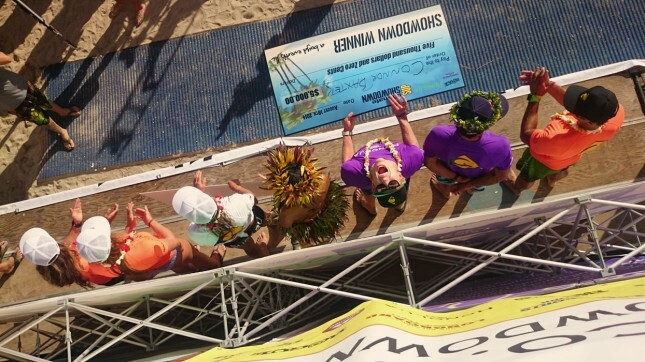 Candice Appleby and Jenny Kalmbach joined Annabel on the women’s podium. Annabel’s win was even more impressive considering she started on the second row (after an early exit in the surf contest) and had to battle through the field to overtake Shak, Jenny and Candice. The women’s race was very tight early on during the Showdown finale, with the four favourites (Annabel, Candice, Jenny and Shakira Westdorp) all in a bunch, but Annabel eventually used her superior speed to pull away. We didn’t get the waves we were hoping for, which took away any advantage the surf racing specialists such as Candice and Shakira may have had. Jenny Kalmbach looked good all event but yet again has to settle for a minor placing on the podium. Shakira (my pick for the win) had looked in form after winning the race qualifying final earlier in the afternoon, however she couldn’t shake the other women in the finale. Special mention to Morgan Hoesterey, who had a consistent all round performance in the racing and surfing and backed it up with a 5th place in the Showdown (after qualifying for the finale as the only ‘lucky loser’ on the women’s side of the draw). But it was Annabel who finished on top, yet again, to prove she’s the best. Apologies to the women, who I didn’t give enough attention to in the live blog during the finale, thought it was such a fast-paced finale that it was hard to follow at times. Can’t wait to see what the CBS cameras made of it all. The men’s race was a very intense affair. Connor and Kai were in the lead within the first 20 metres and never looked back. They started on the front row of the grid (the 32 paddlers in the final were split between 2x 16-paddler start lines, based on performances in the surfing and racing qualifiers earlier in the event), which gave them a big advantage over key rivals Danny and Travis, who were on the second row. Jake Jensen and Zane Schweitzer stuck with Connor and Kai for the first few minutes, but the top two eventually shook off their challengers and made it a two-horse race. In the closing stages Connor and Kai both caught a wave towards the second last buoy, but Connor had the better position and opened up a three board-length lead, which would more or less stay intact until the finish line. Huge effort from young Riggs Napoleon, who sprinted up the beach with Danny and was only a split second away from making the podium. Travis’ effort to fight back through the pack to claim 5th was impressive, but that second starting grid was too much of a disadvantage to make up. Josh Riccio deserves special mention: He was sitting third until the final few metres, when Danny, Riggs and Travis passed him on a wave near the shore. Josh claimed 6th ahead of Gold Coast duo Jake Jensen and Kelly Margetts (7th and 8th respectively). Also we can’t skip over the fact that Kai Lenny almost went through the event undefeated: He took out the finals of both the Surf and Race qualifiers, before going very, very close in the Showdown finale. Definitely an all-round superstar. The action finished literally minutes ago, so we’ll have more reflections on the Showdown over the coming days. For now here are the full results from the Showdown Finale plus the finals of the race and surf qualifiers earlier today. 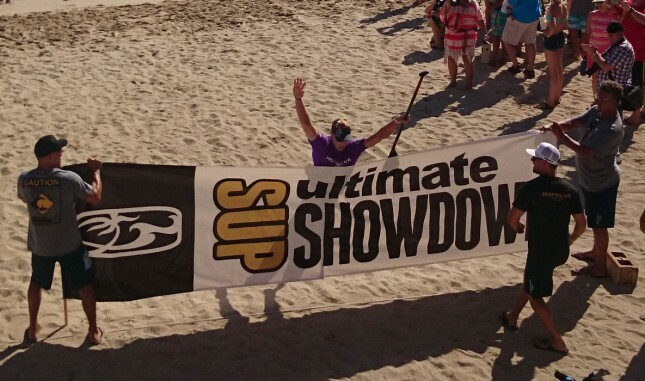 Ok so we’ve just wrapped up day one of the Ultimate SUP Showdown here in Waikiki. That was a long day but it was a fun day, with plenty of action and some crazy levels of elite competition. And these were only the early rounds… Tomorrow it gets serious with the finals of the surfing, racing before the main event hits the water at 4pm local time: The “Showdown” finale where the best surfers and best racers go at it for a shot at the $25,000 prize purse. The big names looked good out there today. My Showdown predictions are looking pretty safe so far with Danny, Jake, Zane, Kai, Travis, Connor, Kelly, Shakira, Candice, Jenny and Annabel all firing in the race qualifiers. Danny won heat #1, with Jake and Zane very impressive in 2nd and 3rd respectively. In heat #2 it was Travis and Kai all the way, with the two sprinting to the line together. In heat #3 Connor made it look easy (he even had time to carry his board up the sand and over the line) while Kelly Margetts and Chuck Glynn showed their potential by nabbing spots two and three. Zane, Danny and Jake were looking very solid in the qualifiers. Other guys to impress were Noa Ginella, Riggs Napoleon, Slater Trout and Ryan Helm, while Sean Poynter upset a few of the racing specialists to comfortably go through as well. In the women’s it was all Candice and Shak in the first semi, then all Jenny and Annabel in the second. Lina had a shocker of a start but came back to qualify while Sonni is the ever-present danger. 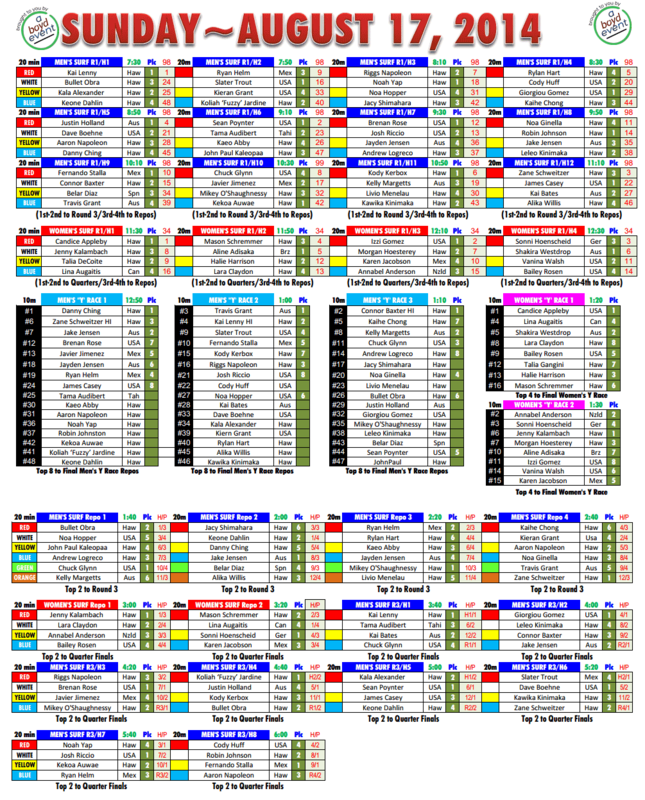 I’m still standing by my predictions, though it’s gonna be super close tomorrow. Very impressive level of competition all round today. Oh and this “Y” race course that’s being used in the qualifying rounds is awesome. It’s basically a Choose Your Own Adventure style of racing: There are two outside buoys and you can decide which one you go around, which means the field will roughly split in half as some go to the left and some go to the right. It totally changes things up and keeps the race undecided right til the end. There were some interesting tactics as competitors tried to decide if going left or going right was the best option. Sometimes you’d have better luck catching a wave back in if you went right, but sometimes it’d favour the left. I really like this style of racing and, in a similar vain to Jacko’s Super Lap, it definitely adds some spice to the mix. It would be awesome for flat water racing. But keep in mind this “Y” course is just for the qualifying rounds. 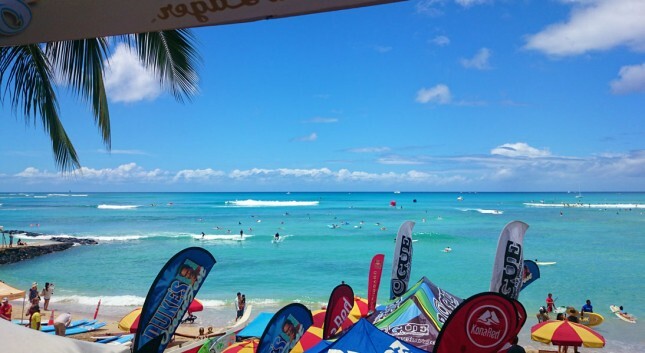 The Showdown finale will use a kind of “Z” shaped slalom course in the surf, where paddlers have to go directly across the breaking waves from one buoy to the next. 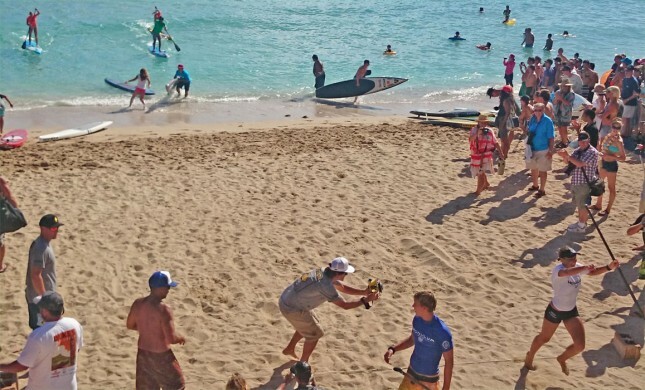 There will be Battle of the Paddle-style carnage but on a whole new level. – The top 8 from each of today’s 3x race heats are straight through to the semi finals of the racing. – The bottom 8 from each heat are through to a 24-man repechage (second chance) round. The top 8 in this 24-man repechage go on to the semis. – The semis will be 2x 16-man races. Top 8 from each go through to the race final. – The top 12 from the 16-man race final qualify for the Showdown grand finale race, where they’ll meet the top 12 guys from the surf contest. – The top 8 women from today’s qualifying heats are already in the final. They’ll be joined by the top two from the 8-woman repechage (second chance) round. Those 10 ladies will battle it out for just 4 spots in the Showdown finale, with another 4 spots in the finale coming from the women’s surf contest. So that was Day 1. 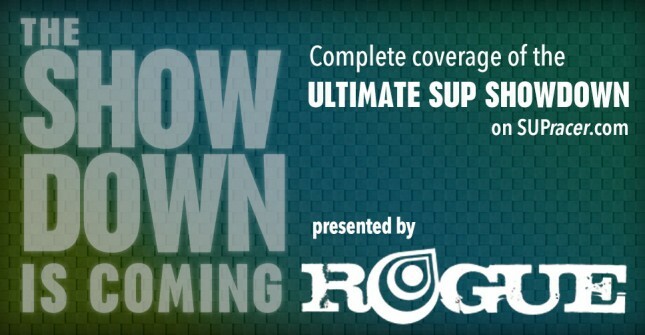 Tomorrow (Monday) we’ll have the Showdown Live Blog running from 8am local time. That includes regular live updates and photos all day, plus play-by-play commentary of the racing finals and the Showdown main event. When should you tune in? The surfing starts at 8am local Hawaii time. That’s 11am Cali, 2pm Florida, 8pm France, super early on Tuesday morning in Australia. The Showdown main event will be at 4pm local time: 7pm Cali, 10pm Florida, 4am Tuesday in Euro land, 12 noon on Tuesday in Australia. Anyway here’s the Day 2 (Monday) Schedule. 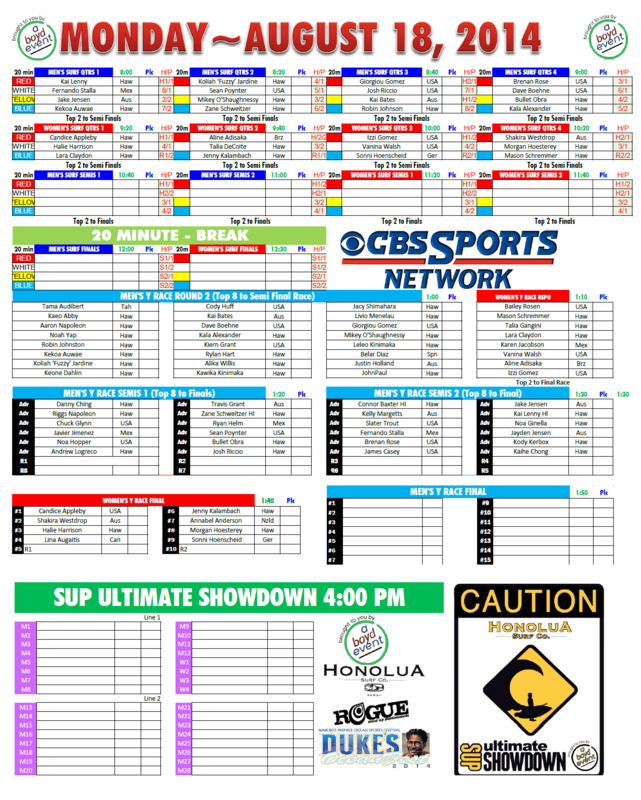 Basically it’s all surfing from 8am til 1pm, all racing from 1pm to 2pm, then a break before the Showdown finale at 4pm. I highly recommend you follow it. This is going to be one crazy finale. Any one of these guys that makes the Top 10, or any of the women that can reach the podium deserve some massive credit. This is some seriously ELITE racing.